The revenge of the 47 ronin has been the basis for many Japanese tv-productions, including everything from single episodes and mini-series to more extensive runs. One of the longer ones is the 52-episode television drama Daichūshingura (大忠臣蔵) which ran for the first time from January to December 1971, on the Japanese NET network. The series was shown on Tuesdays, on the 21:00 – 21:56 prime-time slot. The series has been rerun numerous times since it first aired, and it nowadays also available for purchase in DVD-sets. Daichūshingura features a lot of well-known and celebrated Japanese actors. 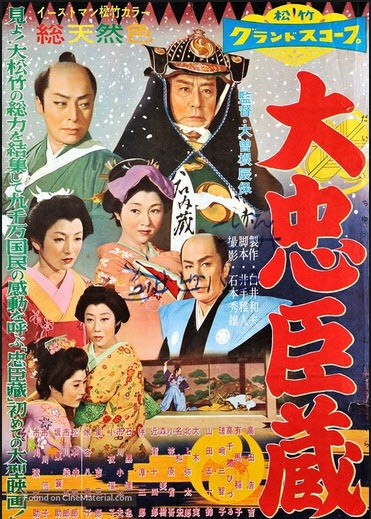 Ōishi Kuranosuke was played by Toshiro Mifune, his wife by Yoko Tsukasa, and their oldest son Chikara by the kabuki stage actor Onoe Kikugorō VII. Both Toshiro Mifune and Yoko Tsuakasa are chiefly known for their work with film. Among other things, Mifune did no less than 16 films with filmmaker Akira Kurosawa, including Rashomon, Seven Samurai, The Hidden Fortress, Throne of Blood, and Yojimbo. In Yojimbo (1961), he played against Yoko Tsuakasa who would later be cast as his wife in Daichūshingura. Yoko Tusakasa, who won the award for best actress at the 17th Blue Ribbon Awards for her role in the film Kinokawa (1966), is also known from movies such as The Birth of Japan (1959), Yojimbo (1961), and Chūshingura: Hana no Maki, Yuki no Maki (1962). In Chūshingura: Hana no Maki, Yuki no Maki, she played the role of Yōzen’in, with Mifune doing the role of Genba Tawaraboshi. Ichikawa Chūsha VIII played the role of Kira Yoshinaka for most of the series, but died after filming episode #47 and was replaced by his borther Kodayū. The role of Chisaka Hyōbu (the Uesugi clan karō) was played by Tetsuro Tamba. Outside Japan, he is arguably best known for his portrail of the Japanese secret service head Tiger Tanaka in the 1967 James Bond movie You Only Live Twice. The three brothers Masakazu Tamura, Takahiro Tamura and Ryō Tamura all appeared in the series. Comedian Frankie Sakai played Akabane Genzō. To a western audience, he is chiefly known for his dramatic role in the 1980s United States mini-series Shōgun, in which he played the part of Lord Yabu. Many famous Japanese actors appeared as guest stars in one or a few episodes of Daichūshingura, e.g. Kabuki actors Kinnosuke Nakamura and Matsumoto Hakuō I, and the ukulele-playing comedian Shinji Maki. This series is one of the inspirations for the slot machine Ronin. A fun retro slot developed by RTG and available in online casinos such as Freespins casino, BoVegas, Slotilda, slotastic and Jackpot capital casino.